Posted on December 6, 2014 December 2, 2015 by Michelle L.
In my quest to eat clean and cut out carbs like rice, I decided that vermicelli is the answer. It has less calories than rice (despite being made out of ground rice), but I like how it absorbs sauces pretty well. It also goes very well with the creamy texture of the avocado. I’m trying out this Vietnamese vinaigrette recipe that I used to flavor the noodles. It is quite similar to a Thai-style sauce, except that it is not as sweet or thick. This vermicelli rice bowl is called bún thịt nướng bó, which I added a few small modifications to suit my tastebuds. This recipe here feeds two, seeing that I usually make these lunch meals for my boyfriend and I. 1. 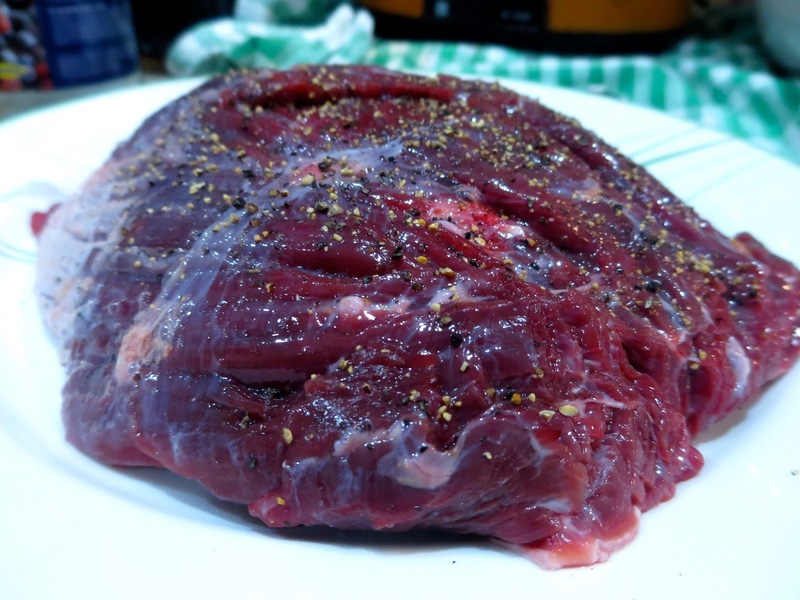 Get your steak out of the fridge and leave it to come to room temperature before cooking. 2. Pat dry with paper towels and season both sides with salt and black pepper. No marinade needed, a good piece of meat just needs the basic seasonings. 3. Heat your skillet on high, until it starts smoking. 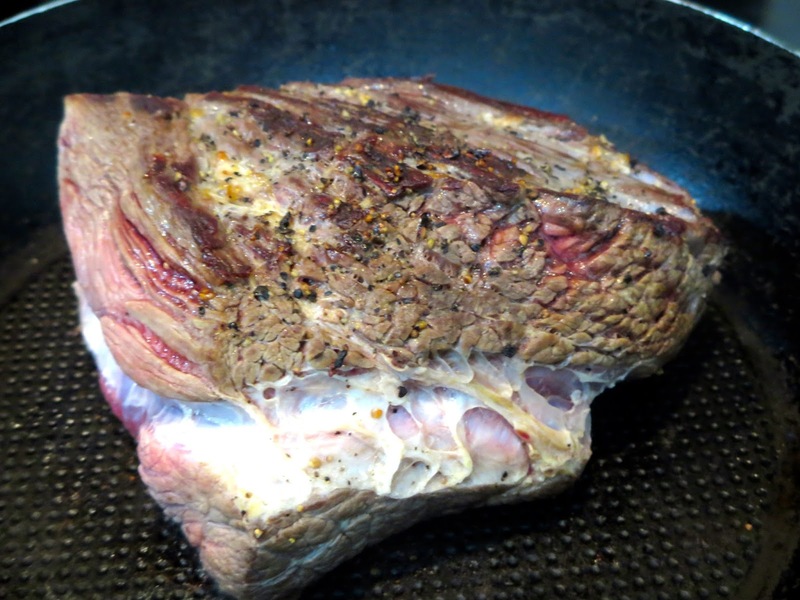 Add a small slick of oil, and place your beef. 4. Cook for 2-3 minutes, without moving. Then flip over and cook 2-3 minutes on the other side. 5. Once it’s done, place it on a plate to rest for about 10 minutes. 6. You can start slicing your beef after that. 7. Cute the avocado lengthwise, and pull it apart. 8. 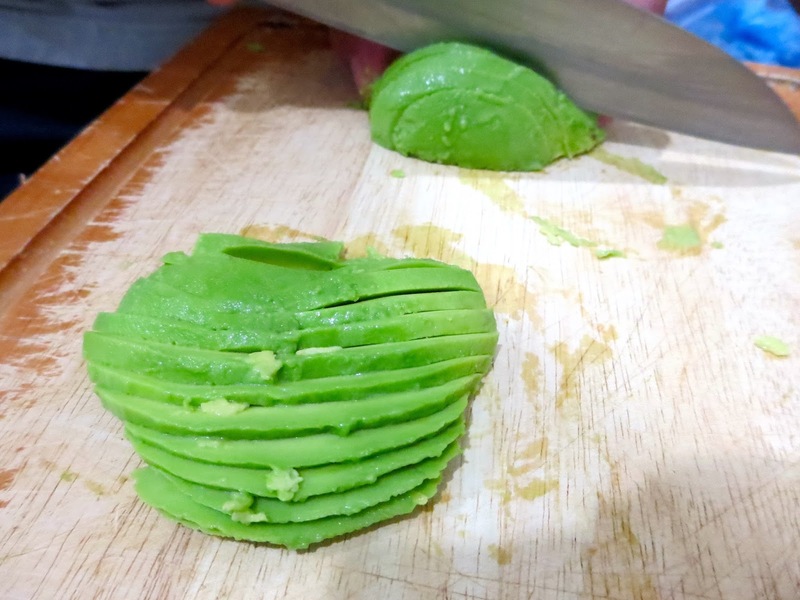 Take the seed out, and gently scoop the avocado halves out from the skin. 9. 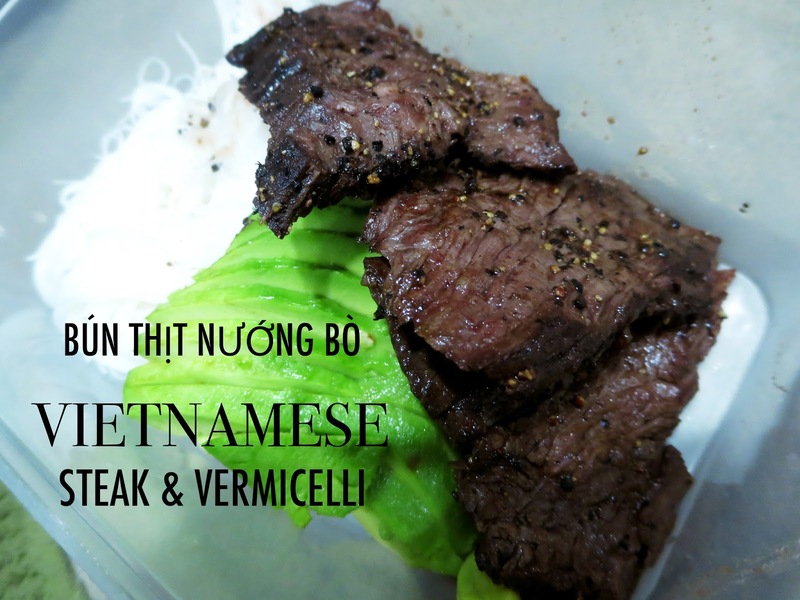 Slice each half into slices and place onto vermicelli in the bowl. 1. 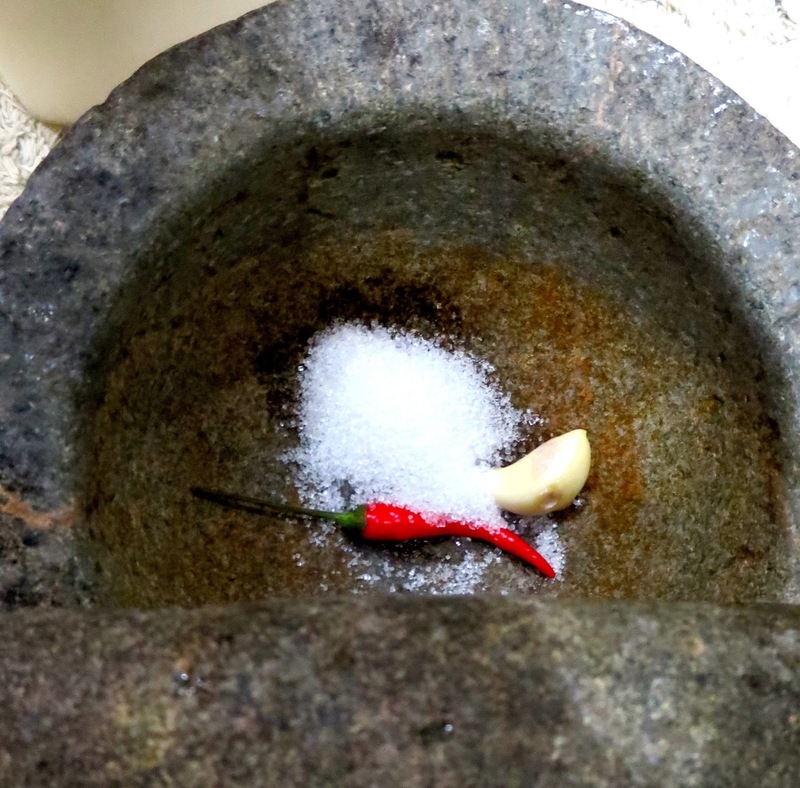 Place the clove of garlic, chilli and 4 tbsp of sugar in a mortar. 2. 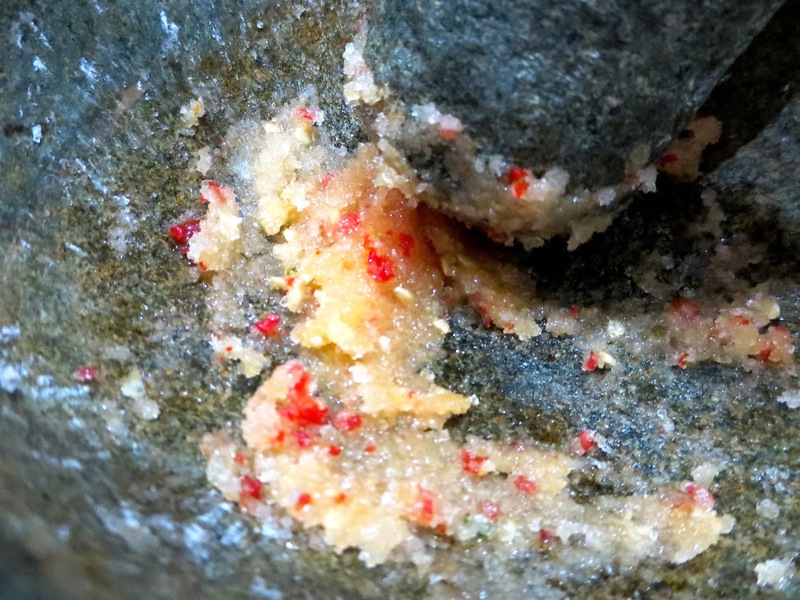 Using the pestle, crush and grind everything until the chilli and garlic are nicely mixed in with the sugar. The sugar should be fragrant and spicy. 3. Slowly add in water and dissolve the sugar mixture in it. You don’t have to use all the water, I used only 3/4 of mine. 4. Now add in the lime juice, followed by the fish sauce. At every step, mis and taste until it’s to your liking. If it’s still too sweet, add in more water or fish sauce. If it’s too sour, add in more sugar and water. Now all that’s left is to assemble the bowl and eat! The sauce goes over the noodles and avocado, with the beef as a side. You may also add in cherry tomatoes or sliced cucumbers for extra colors and texture. Enjoy! Wow! This definitely look great! How does it taste like? Great? The vinaigrette is the main thing that brings it all together, plus I LOVE fish sauce so yes, it is amazing!